Directly Overlooking Port Cyprium Marina in Kucuk Erenkoy, these contemporary detached villas have been designed with panoramic windows and large open spaces (except for kitchen / dining area) so as to take best advantage of the views. 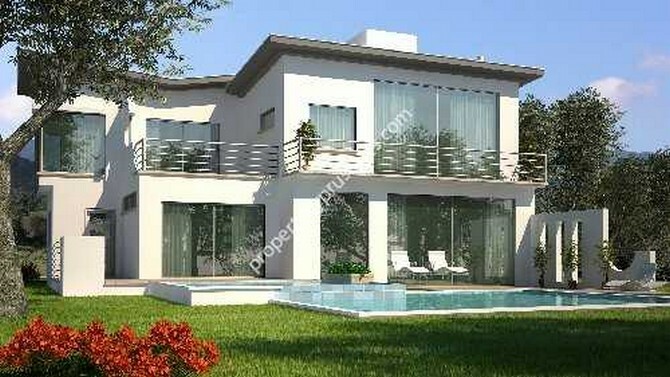 There are 12 villas built on 18,000m2 private plot overlooking Port Cyprium marina. - Rear entry assures full unobstructed sea views immediately as you enter your home. - To the left front facing the marina is a separate kitchen connected to the dining area. The dining area connects to a very large panoramic living room. - At the rear of the property is a bedroom / office with full mountain views and partial sea views. There is also a bathroom / wc on the ground floor. - Directly on top of the living room is an en-suite master bedroom with a floor to ceiling double sliding door / window. - Above the dining room and set back with a good size terrace is the second master bedroom with a panoramic front and side window. - There are also 2 further double bedrooms on the first floor with mountain and partial sea views.